Description: Achievement is not a given. Success is not guaranteed. In order to achieve success and greatness in life, you need more than talent. You need grit. What is grit, and why does it matter? And more importantly, how do you turn your grit into greatness? Pre-registration Expires: 11:59 p.m. CT on Monday, May 6th, 2019. Jeanne Guynn, DTM is District 19 Toastmasters Immediate Past District Director. She has been a member of Toastmasters since November 2010, and has embraced the leadership development opportunities that the program has provided to her. This leadership development journey that she has embarked on is also opening doors in her career. 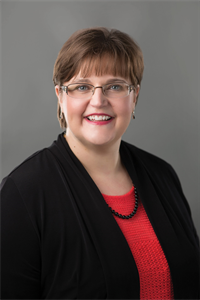 Jeanne has worked at TrueNorth, an insurance and financial services firm based in Cedar Rapids, for 24 years. Because of her dedication to her own personal development and growth, Jeanne is transitioning into a leadership role within her organization. As a lifelong learner, Jeanne has spent many hours working toward her own goals, while helping others identify their goals and a path to achieve those goals. Cancellation/Refund: Cancellations must be received by 11:45 AM CT on Wednesday, Mar 13, 2019 to avoid being charged as a no-show for this chapter event.